HIKYUU hair bangs extensions are made of remy brazilian human hair. Real and natural looking, sewn by hands, and can be trimmed to fit to your hairstyle and features. Material: 100% remy brazilian human hair. Available Color: Jet black, natural black, dark brown, light brown and blonde. Style: Silky and straight, wispy and feathered. Weight: about 3.5g, light and natural. Usage: Push the clip in the opposite direction of the curve, then the clip will be opened. Once you slip it into hair, push down to snap the clip back in place. Can be trimmed, straightened, curled and/or dyed, make sure the temperature of hair flat iron is not too high. Never bleach the hair bangs. Use a sulfate free hair conditioner to wash the hair bangs. Keep the clip dry after washing. If the clip falls off after long time, just sew it by yourself. If you have any questions about HIKYUU hair, please feel free to e-mail us. Enjoy prime service. All of our human hair bangs are shipped by Amazon. You will receive it within 7-15 working days when you choose shipped by seller if it is out of stock. 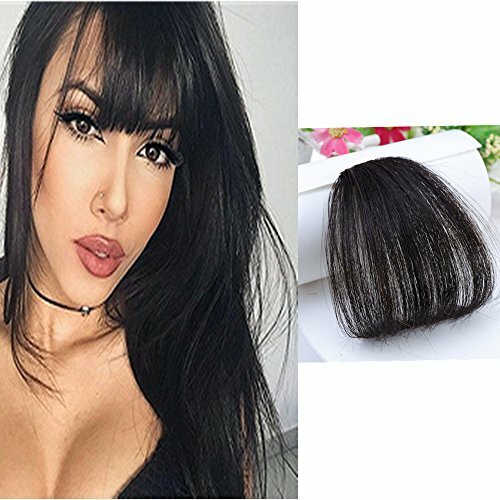 Quick money-back guarantee.Return within 90 days after you receive it.Please keep the clip on human hair bangs in its original box when return. We have our own factory which can ensure you the outlet price. Customized service is available if you need more than 100g hair extensions. Just e-mail us and you will enjoy a fabulous customized service experience. Contact us in advance before you order if you wanna order in bulk. Slight color difference may exist because of different monitors of computers or phones and light difference. We have try our best to minimize the color difference between pictures and real hair extensions. If you have any questions about this product by HIKYUU, contact us by completing and submitting the form below. If you are looking for a specif part number, please include it with your message.